We recently had the opportunity to spend the morning aboard the Sea Shepherd ship in Melbourne with Paul Watson, it was an amazing experience we both will never forget. Our video interview will be up shortly. 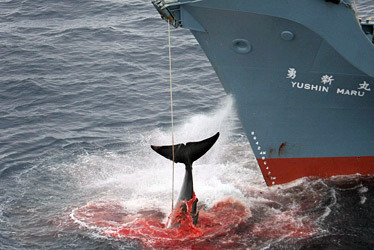 The International whale comission (IWC) is the organisation responsible for regulating whaling. It was formed in 1946 to manage sustainable hunting of whales. Now it is responsible for conservation of whales. In 1982 the IWC voted to introduce a Moratorium on Commercial Whaling, to take effect in 1986, however Japan never stopped killing whales as they use a loophole they found in the legislation. They simply declare that they are killing the whales for 'scientific reasons'. In fact, more than 25,000 whales have been killed since the Moratorium was supposed to come into force. IWC decisions are based on a vote, and Japan "encourages" small third world countries to join the IWC and vote on their side. Japan is alleged to have handed out more than $400 million in bribes so far. They also argue it is a cherished cultural tradition for Japanese people to keep killing whales - However a recent Japanese Newspaper poll found only 4% of Japanese regularly eat whale meat. Blue whales are the largest, and also the rarest whales. There were once 220,000 Blues in Southern Ocean, reduced to around 500 now (in the sounthern ocean) and worldwide about 3000 exist. This is due to past overhunting. Despite being protected since the 1960s, their numbers have not recovered. Minke whales are the commonest of the rorquals (‘Great whales') - mainly because they are the smallest so have not been subjected to the same hunting pressure yet (they were not targeted by whalers until the 1970s when larger species became too rare). Recent estimates show there could already be as few as 250,000 Minkes from 3 different sub-species in the Southern Ocean, despite Japanese claims of close to 1 million. The whales Japan hunts are the same ones that migrate past the coasts of NZ and Australia, and breed in the Pacific Islands. In addition to the ‘scientific' whaling loophole Japanese whalers defy the Southern Ocean whale sanctuary declared in 1994 by killing them right in the heart of the protected area. Japan initially claimed they were taking only Minke whales, but it has since be proven that some meat for sale in Japan during the 1990s came from dolphins, and some from endangered species such as Sei, Fin, and Humpback whales. At the 2006 IWC meeting Japan managed to 'buy' enough support to win the vote declaring that the Moratorium on Commercial Whaling is unnecessary and blaming whales for depleting the world's fish stocks. Thankfully, because of all the publicity Sea Shepherd has generated this whaling season, it has forced the issue to be constantly in the media, much to Japan's embarassment.